It is cherry season in California. For a few short weeks in May or June fresh cherries appear at the Farmers’ Market in Berkeley. First there are Brooks, then Burlats. Later there are Bing cherries. I eat them all. Mostly, I eat them fresh, for a snack. Lately I have been sneaking them into my morning cereal: my current favorite concoction involves 1/3 cup blue cornmeal cooked in 1 cup of milk with a bit of salt, a small handful of raw almonds pounded in a mortar, a handful of stoned cherries and a couple teaspoons of shredded coconut. This is also good with rolled oats — if you use oats, use 1/2 cup. Do any of you have binders full of recipes that you have clipped from the food sections of local newspapers? Do you have a lot of recipes you haven’t actually cooked? Me, too. Sometimes I try one and toss it out with a “What were they thinking?” gesture. Sometimes I learn something. Sometimes I just store them, loosely organized by main ingredient, in a huge binder that takes two hands to lift off the shelf, but I know they are there waiting for “someday” when I’ll cook them. Well, folks, today was someday. I made a trip on the bus to the Farmers’ Market yesterday to buy more basil for more pesto and to buy cherries for this bread. Insert disclaimers here. One, I don’t generally like focaccia — it is too thick, too bland, with the wrong ratio of toppings to crust: I think of it as failed pizza. Two, I think chocolate-covered cherries are revolting. My Grandmother liked them: nasty, sickly cherries in too sweet milk chocolate. And cherry cordials, worse, if possible: bad chocolate filled with wet cherry filling that squirts you when you bite into it. Yuck. Three, my favorite cherry recipes involve sour cherries, either canned or dried, since fresh sour cherries are hard to come by in this part of the world. Four, I can’t stand anything cherry-flavored: cherry flavor reminds me of medicine. This includes cherry Starbursts (why, oh why?). The only exception I can think of is Royal Crown Sour Cherry candy — do they still make it anymore? But this cherry focaccia was calling my name. First of all, it is a filled focaccia: you make two circles of dough. You put fresh, pitted cherries on top of the first circle, sprinkle it with chopped bittersweet chocolate, and put the second circle on top. Then you push more cherries into the top layer and sprinkle it with raw sugar before it goes into the oven. Plus, you need a starter to make this and I keep a jar of sourdough starter in my refrigerator at all times. I fed the starter yesterday and let it sit out on the counter while I went to the market and bought cherries. I wanted to send you to Ed Murrieta for the original recipe, but when I Googled him the first thing I found was an article about how his entrepreneurial business had failed, leaving him to live on food stamps. Then I found some recipes including marijuana. Wherever he is now and whatever he is doing I wish him well and thank him for this gorgeous focaccia recipe. I could send you to the newspaper site, but they seem to want you to activate a free trial subscription to let you read the recipe. What can I do? I can rewrite the recipe — I did make a couple of changes. Here’s the bad kitty confession. Murrieta’s recipe calls for bread flour. In my heyday when I had a regular job and regular paychecks I would have gone out and bought bread flour. I would have insisted on bread flour. Now I am not so proud or so picky: I use what we have on hand. I am an experienced baker and can handle sticky doughs and doughs behaving badly. So I will tell you that Ed Murrieta called for 2 and 3/4 cups of bread flour, plus additional flour on the board during the kneading and shaping phases. I winged it with unbleached flour and some whole wheat flour to give it a more rustic quality. I’ll show you. Murrieta called for a starter made of 1/2 tsp dry yeast, 2/3 cup of water and 1 cup of bread flour. You mix this up in a glass jar with a wooden spoon, cover it with cloth and let it ferment on the counter for at least twelve hours (and up to 36). I skipped this, and just added 2/3 cup of my sourdough starter to the dough. If you already have a starter, you are good to go. If you want an official sourdough starter recipe, go here. 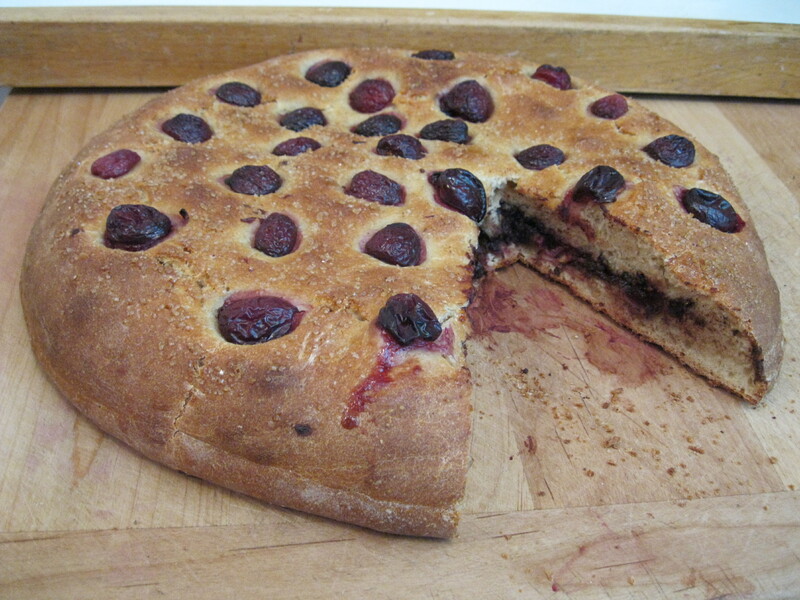 Cherry Focacccia. 8″ x 8″ gouache on paper. Sharyn DImmick. Make the dough first. You can pit cherries and chop chocolate while the dough rises. You can even go to the store for cherries and chocolate while the dough rises if you don’t go on the once-every-forty-five-minutes bus. Dissolve 1 and 1/2 tsp yeast in 1 cup warm water. While the yeast proofs, stir together in a large bowl 2 and 3/4 cups bread flour, 3 Tbsp sugar and 1 tsp kosher salt. If you do not have bread flour and are intrepid, start with 1/2 cup whole wheat flour and 3 and 1/4 cups unbleached flour (You will have to add more). Make a well in the center of your dry ingredients. Add proofed yeast, 2/3 cup sourdough starter (or Ed’s starter, above), 1 cup lukewarm water and 3 Tbsp olive oil. Mix with wooden spoon until a light dough forms. If your dough is more of a batter than a dough, add flour 1/4 cup at a time. Flour a bread board or other work surface and keep the flour handy! You might want to make sure your flour bin is at least half-full. Turn out the dough onto the board and attempt to knead it. If it sticks to the board badly, knead in more flour, dust more flour on the board, pry it up and try again. Eventually, you will work enough flour into the dough that it resembles roll dough and is smooth and uniform in appearance. If you are smart, you will oil the bowl before you put the dough back in it to rise. Cover the dough with a damp tea towel and let it rise until double — 1 and 1/2 to two hours. Now, go away and amuse yourself or clean your counters and put away your ingredients except the flour — you are not done with that. Before the dough is risen you will need to pit 2 cups (one pound) of cherries and chop four ounces of chocolate. I used a 70% Lindt bar that had cherries and chili in it. When your dough is risen, put it on your floured board and let it rest for five minutes. You can use this time to oil a pizza pan or baking sheet. Divide dough into two equal portions. Ignore one while you flatten, dimple and pull the other into a ten inch circle. See pizza-pulling instructions here. (Murrieta rolls out his). Transfer first portion to oiled pan. Spread 3/4 of your cherries on it and top with chopped chocolate. Flatten, dimple and pull the second circle into shape and place it on top of cherry-chocolate filling. Pinch the edges to seal the dough. Then decorate the top with the rest of the cherries, pushing them cut-side down into the dough at attractive intervals. Let the dough rest for thirty minutes while you preheat your oven to 400 and do a round of clean-up. Just before you put the focaccia in the oven sprinkle it with raw sugar. 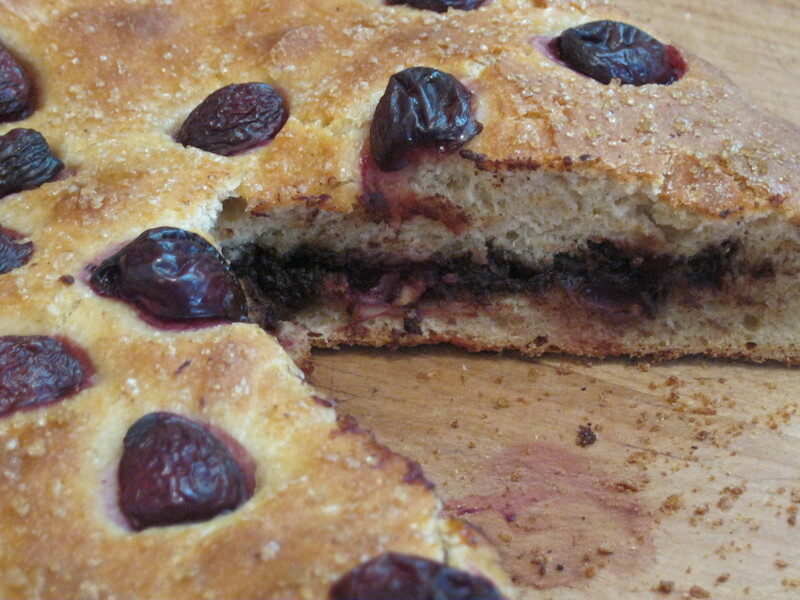 Cherry Focaccia Close-up. Photo by Sharyn Dimmick. Bake for forty-five minutes or until top and bottom are browned to your liking. Murrieta says to let the focaccia cool and then cut it into wedges. Ha, ha, ha, ha, ha. I let it cool for approximately five minutes and then cut a small wedge, which I ate standing at the cutting board. Then I reached for the knife again, which was smeared with melted chocolate. I ate the second piece standing in front of the board. Then I cut a much smaller wedge. Then I stepped away from the cutting board, drank a glass of milk and made tea, which I took upstairs so that I did not stay in the kitchen eating focaccia. It was that good. It was sort of like someone had taken my two favorite things, crusty bread and pie, and magicked them into a single entity. Crusty, gooey, chocolatey, not too sweet, with a fresh cherry taste on top. Cherry season is short. If you like bread and pie, make this now. Now. And invite some friends over if you don’t want to stay in your kitchen eating the whole thing. You could just call it cherry Kryptonite. Food notes. This recipe is perfect as is, once you get the flour right. But it is ripe for variations. Try other kinds of chocolate and other kinds of fruit: fresh figs? And then branch out and use almond paste or ricotta filling with cherries or peaches or blueberries. Yum. “Spring green” is a common phrase and color name. The spring in California is rich with greens: before we get to the reds, blues and yellows of summer we have pea green, asparagus green, artichoke green. And in the farm box we have beet greens, Swiss chard, kale, green garlic, spring onions, lettuce, bok choy and peas. It is little wonder I was drinking my greens recently, shoving some spinach into a smoothie to make way for new rounds of greens. Green Calzones. 8″ x 8″ Gouache on paper. Sharyn Dimmick. I have made pizza for many years and somehow never made the leap to calzones. The dough is the same, the famous Cheese Bread sourdough recipe made with a cupful of whole wheat flour. The technique for shaping calzones is the same: you begin with eight small disks instead of three larger ones and go through the dimpling and pulling process. I might have gone another few years without making calzones, except that Betsy’s recipe for calzones caught my eye and lingered in my imagination. Betsy made hers with fresh kale. I made mine with leftover cooked chard. I followed Betsy’s guidelines for the cup of feta and the 1/4 cup of dry cheese, but I used pecorino Romano where she used Parmesan. Most of you know the drill for sourdough by now: if you want sourdough pizza, bread, waffles or biscuits you have to make up a sourdough starter. You need to feed it occasionally, but if you use it once a week or more it doesn’t take much care and feeding. I fed my starter yesterday morning with a half cup of water and a half cup of unbleached flour, shook it a few times and left it out on the counter. Come afternoon I came back and made pizza dough with a half cup of starter, 2 and 1/4 cups flour, 1 cup whole wheat flour and a generous teaspoon of kosher salt. Read the gory details here. This morning I took my pizza dough out of the fridge at eight. At 10:22 I removed its dish towel, formed the dough into eight small rounds, floured the damp towel and let the dough sit while I made filling. I also put my pizza stone in the oven and cranked the heat up to 450, deploying three racks: one for the pizza stone, two for the trays of calzones. First step: dump cooked chard from frying pan into pizza dough bowl (Why do more dishes than you have to?). Heat same frying pan over medium heat while you slice the white of a small leek and the shoots of some green garlic, wipe 3/4 of a pound of mushrooms with a clean damp cloth and slice them. Add olive oil to the skillet and saute your leeks and garlic while you continue to slice mushrooms. Add leeks and garlic to chard. Saute mushrooms in two batches, adding oil as necessary. While you have the oil out, lightly oil two pizza pans. Add sauteed mushrooms to chard, leeks and garlic. Crumble 1 cup of feta into the vegetables. Use microplane to grate 1/4 cup dry cheese over top. Grate some nutmeg to taste and add a sprinkle of red pepper flakes. At this point, the faint-hearted or fanatically germ-phobic might give this mixture a stir, but I like to work with my hands, so I plunged my hands into the bowl and mixed. Then I washed and dried my hands before turning to the dough. Using the dimpling and stretching techniques detailed in the pizza post I made my eight disks into eight five-inch circles, one at a time, so that I could fill and fold each calzone before making the next one. Again, I used my hands to scoop filling onto half of each calzone, but the fastidious may use a spoon and the precise may use a scoop or measuring cup, but you will need to use your hands to fold the crust over the filling and seal the edges. Once your calzones are filled, folded and sealed, give each one slash with a sharp knife to allow steam to escape. I use a stainless steel steak knife. If you keep a clean razor in your kitchen that will work, too. I put one tray of calzones in while I filled the others. When the second batch was filled and folded I switched the first tray to a higher rack and started the second one on the middle rack. In ten minutes, I switched them again. We like things toasty and brown so the first tray was probably in the oven about thirty minutes. When I took the first tray out I turned off the oven and let the second tray finish cooking from the residual heat of the oven and the pizza stone. By the way, I did not make the dough green. It is not St. Patrick’s Day. If you eat your spring greens you will see plenty of that color. Food Notes: Betsy serves her calzones with marinara, which I’m sure is good. We ate ours plain to get maximum crust effects. Variations are legion: you can use any cheese you like, although the combination of a creamy one and a dry one produces a nice texture and flavor without a grease factor. If I could only have two cheeses for cooking they would be feta and Parmesan so Betsy’s choice worked for me, but you could use goat cheese and dry Jack or ricotta and Asiago. If you won’t eat or drink your greens, stick to mushrooms or pile in some meat. I badly wanted to add some roasted red peppers, but I didn’t want the mixture to be too wet, and I would have added sun-dried tomatoes if I hadn’t eaten them all by March. The same dough that makes crisp thin crust pizza transforms into a breadier dough you can hold in your hand when stuffed in this manner. Enjoy. Blog Notes: Twice in the last week kind persons have nominated me for the Liebster Blog Award, an award for blogs with under 200 subscribers. While “The Kale Chronicles” fits that size, it has been previously nominated more than once. Because it can be difficult to establish how large or small a blog is, I will merely encourage you to visit the folks who nominated me, Peri’s Spice Ladle (Indian specialties) and artratcafe. (original art and occasional wonderfully illustrated posts of food descriptions from literature). 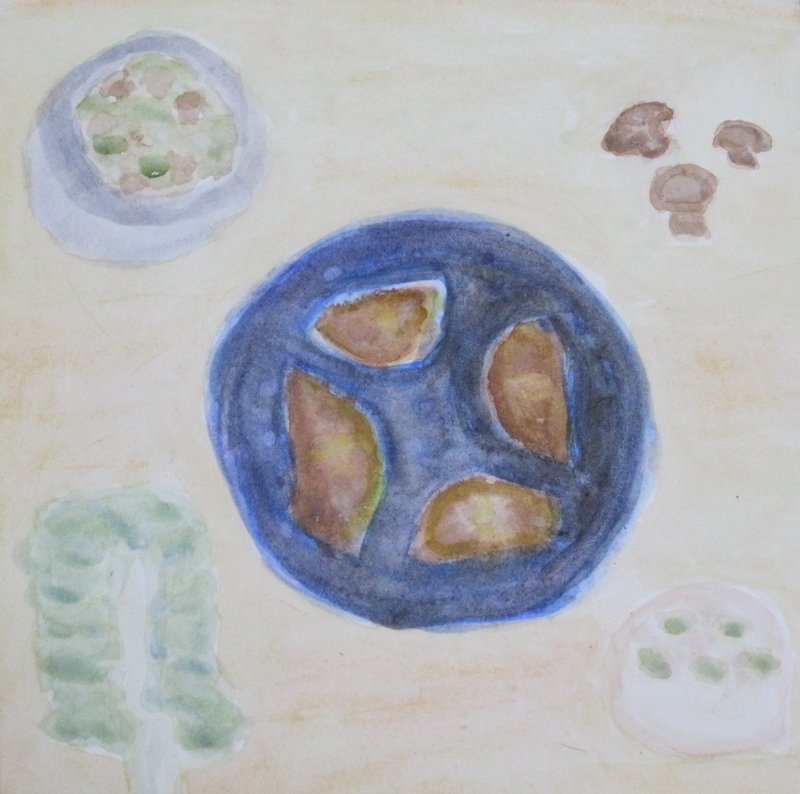 I will further encourage you to visit Susartandfood. (I go for the stories). Sourdough Pizza with Red Peppers and Olives. 8″ x 8″ Gouache. Sharyn Dimmick. I mentioned in my last post, A Sunday in the Kitchen, that I had made sourdough pizza dough and put it in the refrigerator. Sourdough produces a thin, crispy crust as long as you don’t overburden it with too much sauce and cheese. Sourdough pizza dough needs to sit for around nine hours so the easiest way to make pizza is to make the dough the night before you plan to make the pizza. Monday afternoon I pulled it out at about 2 PM. At 4:30 I divided the dough into thirds and shaped each third into a round. I then let it rest for twenty minutes, covered — sourdough is a lazy dough and it likes a lot of rests between steps. While the dough was resting I stacked up three racks in my oven from the lowest position to next to the highest, placed a pizza stone on the lowest rack and preheated the oven to 450. The oven needs 45 minutes for the stone to get good and hot. Then I turned my attention to cheese. I sliced about a pound of mozzarella and then cut the small slices into small pieces. I could have grated it but my hand gets tired grating and it is just as easy to cut slices, stack the slices and cut small pieces from the stack. Plus, I don’t have to clean a grater. I then used my trusty microplane to grate Pecorino for flavor, 1/4 to 1/2 cup. Don’t put it away yet — you’ll be grating some for the top as well. Parmesan is good, too. If you are out of hard cheese, consider adding some cubes of feta. A pound of mozzarella is enough for three ten-inch pizzas: you don’t want more, especially if you are trying to make thin crust pizza that stays in one piece. By the time I have sliced all that and oiled some pizza pans, the dough is ready for shaping. I do this by hand, because it is fun. Take your first round and flatten it into a disc. Now poke your eight fingers into the dough as though you were typing, making concentric circles of dimples, leaving a small border at the edge. After your dough is flattened and dimpled, slide the backs of your hands under the dough and turn your hands, pulling the dough in the process. You will develop a feel for it. Stop before you make holes in it — it will need some thickness to support the toppings. Don’t pull it out to more than ten inches diameter, please. If you make a hole in it, it is best to collapse it, dimple it and pull it again rather than trying to patch it. Throwing it up in the air is completely unnecessary — I would only recommend doing this if you have worked in a pizzeria and are trying to impress your children. Place the pizza on the oiled pan. Optional step: If you want a tiny bit of insurance that your pizza won’t leak or tear in the middle, you can put the pulled dough into the oven for a few minutes. I tried this for the first time the other day. The advantage is that my pizza did not tear. The disadvantage is that the crust rises a little and thus is thicker. Now it is time to build your pizza. Sauce is optional. Sometimes I make pizza without it, sandwiching fresh vegetables between layers of cheese on the pizza crust. The advantage is that without the sauce you will have less likelihood of making a thin-crust pizza that develops a sink-hole in the middle when you try to transfer it between racks. 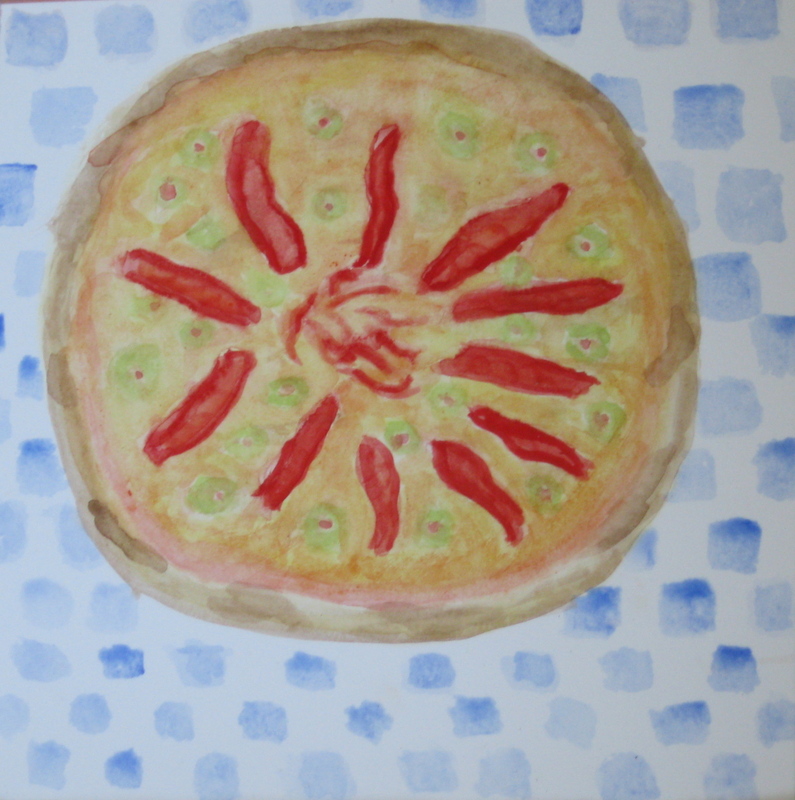 If I am making a traditional pizza I usually take some sauce from the nearest jar of Prego marinara and spread it thinly on the pizza dough, thinly enough so that what I have is streaks of red with white crust showing. Do not glop on the sauce (Homemade marinara would perhaps be even better, but Prego is one of my shortcuts: my favorite is the Italian sausage flavor). After I spread the sauce, I divide most of the cheese between the three pizzas, saving a little to drizzle on top of the toppings. For these pizzas I used sliced Spanish olives (the kind with pimentos inside), strips of roasted red bell pepper that I tore with my hands, and tiny cubes of ham from the freezer. I made one vegetarian pizza and two with ham. I sprinkled the reserved cheese over the vegetables and grated a little more Pecorino on top. I usually use whatever odds and ends of meats and cheese we have (ham, Canadian bacon, sausage) and vegetables, including peppers, cooked eggplant, mushrooms, olives or tomatoes. If you have parsley, cilantro or fresh basil, it is nice to garnish the pizzas with them when they come out of the oven. To cook the pizzas, set the first pizza on the middle oven rack for ten minutes. Then rotate pizza number one to the top rack and start pizza number two on the middle rack. After another ten minutes, transfer the first pizza directly onto the pizza stone. I use a wooden peel to make the transfer and I pull the rack out a ways to make it easier. I highly recommend getting a peel and a pizza stone if you plan to make pizza frequently. Continue to bake the remaining pizzas in the same rotation. Please note: baking times are approximate — if your pizza is too soft to transfer to the stone, bake it a little longer before the transfer. If your pizza on the top rack is browning too fast, transfer it a little sooner. Food Notes: You don’t need to buy fancy whole milk mozzarella for pizza. 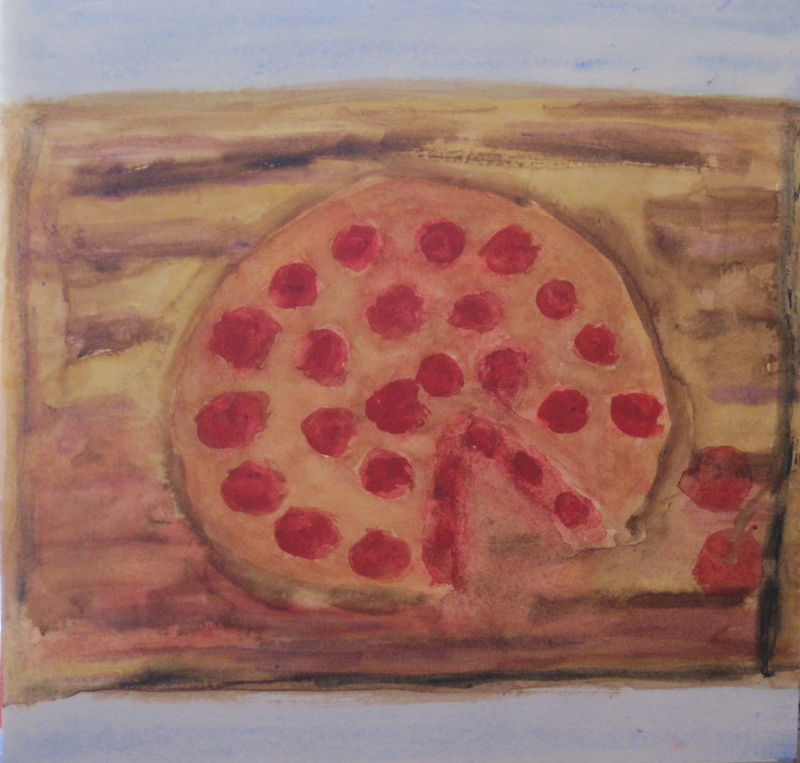 When I was first learning how to make it I asked the guy at The Cheese Board what cheese they used for their pizza. He sold me some plain part-skim mozzarella. Now I buy it in two pound blocks whenever I find it on sale and stash it in the freezer for pizza-making. I would normally caution you not to cook with cheese you would not eat out of hand, but I only use mozzarella in pizza and emergency cheese sandwiches and I always add some other cheese to add flavor. I am not going to tell you what to put on your pizza. If you live in New York, you may choose to stick to cured meats, onions, peppers and mushrooms. If you live in California and you want to make pizza with gorgonzola and fresh figs or purple cabbage and walnuts, that is your privilege. It is nice to use fresh tomatoes in tomato season and things in jars in the winter. I usually make all three pizzas at once. I like pizza a lot and it keeps well and reheats well. Sometimes I sandwich a cooled pizza between pieces of cardboard and put in in the freezer for later. If you do not have sourdough starter, you can make pizza dough with yeast, water, flour and olive oil. I use The Cheese Board’s recipe from The Cheese Board Collective Works. You will find that recipe here. And, as I mentioned on Sunday, I like to substitute whole wheat flour for part of the flour. I learned a good deal of what I know about pizza-making from this book: if you would like step-by-step photos, plus several recipes for pizza, master sourdough, yeast breads and assorted bakery goods, I highly recommend purchasing the book. And, no, I am not on the payroll — I’m just a happy customer. If you can buy it from your local independent bookstore, I’ll be even happier.